The discovery of gold in 1851 put Bendigo on the map, with 15,000 people moving there is just three years, drawing migrants from throughout the UK, Germany, America and China. A direct rail link to Melbourne in 1862 and to Echuca, to the north, on the Murray River by 1864, opened up a major corridor for passengers and freight. As in all gold rush towns, there were hotels a plenty along with local industries, including brewing and flour milling, catering to the rapidly growing population. Many of the grander commercial buildings remain, most notably the imposing Shamrock Hotel, built in 1897. It is diagonally opposite an equally imposing Post Office which now caters to goldfield tourists. Bendigo suffered more than its larger goldfields neighbour Ballarat, from the decline of gold mining in the early twentieth century. Its population almost halved between 1901 and 1911, falling from 30,774 to 17,883. From the 1920s gradual population growth took place, with tramways, railways and a soft drinks factory as major employers. A cultural centre for the surrounding hinterland, its Art Gallery remains a popular attraction, as do its grand buildings, including an enormous Roman Catholic Cathedral. As an express train from Melbourne takes almost two hours, Bendigo is beyond commuting distance from the capital, 130 km by road. Bendigo is a provincial city 130 km north-west of Melbourne. It has a large urban component adjoining its commercial centre, extending well beyond Bendigo's original municipal boundaries. In 1994 the municipal boundaries were expanded into the rural hinterland, and the statistical district which comprises the urban component is about 30 by 30 kilometres. Bendigo is Victoria's third largest provincial city, after Ballarat and Geelong. Until gold was discovered at Bendigo the locality was part of the Ravenswood or Mt Alexander pastoral run (1840). There is evidence that the name Bednego had been given to the creek in 1848, near the place where gold was discovered three years later. The name probably derives from Abednego, the nickname of a prize fighter, William Thompson of Nottingham, England. A local pugilist, possibly a pastoral employee, was known as Bendigo. The official discovery of gold at Bendigo occurred in October 1851, a few months after discoveries at Clunes (June), Mount Alexander (July) and Ballarat (August). The Bendigo Creek contained rich alluvial gold, as did several nearby gullies. The inrush of miners was notable for Cornish, Welsh, Irish, Scots, 'Yankees', Germans and Chinese. 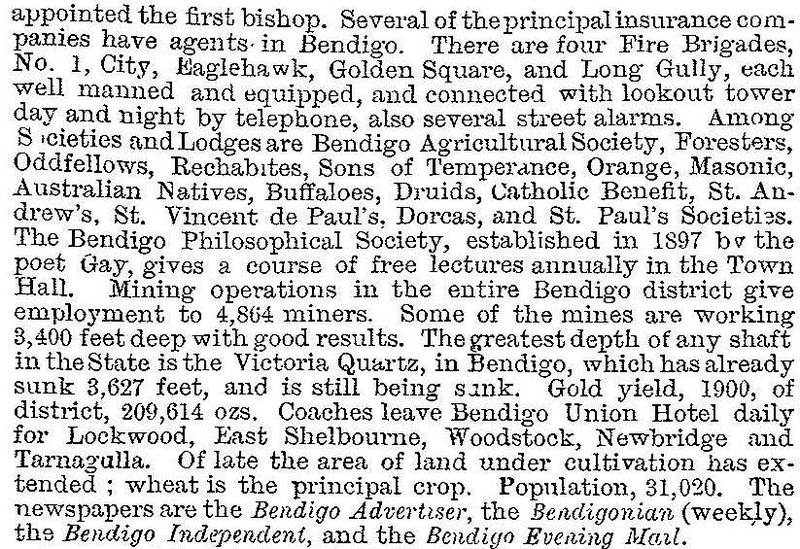 A census of Bendigo in 1854 recorded a population of nearly 15,500 people. Until then the settlement had grown haphazardly with traders' stores, hotels, boarding houses and dwellings ranging from calico to more permanent structures. A town was laid out, removing the commercial centre to Pall Mall. The name Bendigo was also removed, being replaced by Sandhurst, the choice of the Goldfields Commissioner, W.H. Wright, who had attended Sandhurst College, England. His choice had been approved by Lieutenant-Governor La Trobe the year before. Religious observance was manifested by the Sandhurst Methodist Circuit (1854), servicing five Wesleyan churches which had been built in previous years. George Henry Backhaus, pioneer Catholic preacher, had also erected a church in 1853. There were several church schools, but the school children were estimated to be one-fifteenth of Bendigo's total population. Less than a quarter of the estimated school population actually attended classes. The agitation over goldfields miners' licences culminated in the Eureka rebellion at Ballarat in 1854. An inquiry into the Goldfields Commission resulted in its abolition. As a de facto organ of local government it was cut back to mining regulation, leaving room for a municipal body. The Sandhurst municipality was proclaimed on 24 April 1855, coinciding with the proclamation of Castlemaine borough and the first few inner-Melbourne boroughs such as Prahran and East Collingwood. After alluvial mining, puddling worked over new finds and the leavings of inexpert alluvial miners. Upwards of 2000 puddling machines were working by the end of the 1850s, polluting waterways with sludge. Their activity was overtaken by underground quartz reef mining, the first reefs being opened in 1854. Gold yields during the 1850s were often over 400,000 ounces a year in and near Bendigo. In 1858, when the population was 28,928, the gold yield was 447,212 ounces and a contract was let for the start of a railway line from Melbourne. It was the first rural line in Victoria, reaching Bendigo in 1862 and on to Echuca in 1864. In 1865 Bailliere's guide described Sandhurst as 'a fine handsome town, containing a large number of imposing brick and stone stores, and shops with plate glass windows, in which are exhibited all the articles of necessity or luxury imported into the colony'. There was also a hospital (1858), a benevolent asylum (1857), a mechanics' institute, a museum, the Lyceum theatre, three newspapers, a waterworks trust, four foundries, two breweries, a flourmill and over 50 hotels. The Shamrock was one of the principal hotels. The reefs ran generally north-south underneath Bendigo. The landscape was dotted with poppet heads and mine workings. In summer the air was laden with dust. Nevertheless the miners and their families needed housing, and the forerunner of the Bendigo Building Society was established in 1865. The German miners left an enduring imprint. Several became successful farmers and vignerons in and around Bendigo. William Vahland from near Hanover was a not particularly successful miner for three years, and went into an architectural partnership with Jacob Getzschmann. They designed the hospital, benevolent asylum, mechanics' institute, school of mines (1873), Union and Commercial banks, masonic hall (1874), St Kilian's Catholic church (1888), Methodist Sunday school and church (1865 and 1877) and the ornate town hall (1885). Well before then, the Sandhurst borough had been proclaimed a city on 21 July 1871. It was denied its natural growth, however, when Eaglehawk borough was formed on its north-west corner in 1862. Bendigo became a railway centre. The network was extended to Bridgewater and Wycheproof (1876-83) and then to Heathcote, Swan Hill and Boort (1883-90). Extensions further into the north-west wheatlands and irrigation areas occurred in the 1890s. Water supply for mines and residential use was a problem. Reservoirs were built on the Coliban stream system northwards from Malmsbury during the 1870s, continually undergoing enlargement until the 1930s. Trams began service in Bendigo in 1890 and by 1903 an electric-powered service had a track network from Eaglehawk to Quarry Hill, via Pall Mall, intersecting with the line from Golden Square to Lake Weeroona. The intersection was named Charing Cross. Underground reef mining was producing annual yields of around 200,000 ounces of gold. Employees formed a trades and labour council in 1896, a body which was to have influence in labour politics for decades to come. By the turn of the century Bendigo's mines and miners were in trouble. The cost of keeping out water was growing, and the cost in miners' lives was terrible: miners' phthisis and tuberculosis claimed over 1000 men between 1875 and 1905. Gold production in 1917 was one-quarter of the amount for 1904, and the dividends one-fiftieth. Capital investment in gold mining was withdrawn. Other entrepreneurs also withdrew, such as Sidney Myer from his Pall Mall drapery when he began his emporium in Melbourne's Bourke Street in 1908. During 1901-11 Bendigo's census population fell by 42%. In 1907 a State continuation school was opened, absorbing several private secondary colleges and later becoming a high school. The school of mines became a State technical school in 1909, the forerunner of an institute of technology and a campus of La Trobe University. Several foundries had supported the gold industry. Their skills and manpower were a foundation for the Railway Workshops, an ordnance factory (1941) and numerous clothing and textiles factories. During the 1930s the processing of mine tailings gave reliable gold returns. After the war the ordnance factory was a major employer, having a workforce of about 650 (1982) and enlarging its skills to include sophisticated naval and missile components. The poultry and stockyard industries expanded to meet the demands of postwar migration, and the local building industry experienced prosperity. Tarax soft drinks factory had started in Bendigo in the 1890s and by the 1950s it was a state-wide brand. Its proprietor, George Pethard was a councillor for 20 years and three times mayor of Bendigo. His moderne-style house in High Street, Golden Square, is recorded in heritage studies. In 1951 a former boilermaker and publican, Frank McEnroe, first marketed his chiko rolls. They became a national brand, continuing into the third millenium. His heritage sites are overlooked in professional studies. To rectify this they are recorded here: house, 31 Horace Street; factory (McEnroe's milk factory), western end of Skene Street. Beginning in the late 1940s Bendigo's urban area began to expand into surrounding shires - Flora Hill and Kensington in Strathfieldsaye Shire, Kangaroo Flat in Marong Shire and Epsom in Huntly Shire. Between 1947 and 1996 the population of Bendigo and suburbs nearly doubled. The reclamation of the landscape from mine waste was a prelude to the fostering of tourism in Bendigo. When the State Electricity Commission (which had inherited the electric trams in 1929) closed the tram system in 1972 a trust was ready to establish a tourist tram route along Pall Mall, from the restored Central Deborah gold mine at one end to the Chinese Joss House at the other. Described as the talking trams, they gave travellers a prerecorded description of the passing streetscape. Many of Bendigo's registered buildings are along the tram route or in the Charing Cross crossroads: law courts (1896), post office (1887), former mining exchange (1871), Shamrock hotel (1897), four bank buildings, and several features in Rosalind Park which adjoins Pall Mall. The Sacred Heart Catholic cathedral, the largest one in Victoria outside Melbourne, is west of Pall Mall. Built from Barrabool stone and Harcourt granite, its conception began in the time of Dr Backhaus and it was completed in 1977. One of the first organised sporting events in Bendigo was the Sandhurst Cup, run by the Bendigo Jockey Club in 1858. The racecourse at Epsom is a major country venue. In 1861, a few years after the first officially recognised Australian Rules football match between Melbourne's Scotch College and Melbourne Grammar, the Sandhurst team was formed, playing against teams from mines and craft industries. The Bendigo Football Association was founded in 1861 (renamed League in 1913), including teams from Castlemaine to Echuca. The Bendigo 1000 and other cycling events are held during the Easter Fair, which includes a Chinese procession. The fair began in 1871 to raise money for the hospital and the benevolent asylum. Arts and crafts are best represented by the Bendigo Art Gallery (1887) and the Bendigo Pottery, Epsom. The gallery has an important collection of French nineteenth century paintings and a large Buvelot collection. La Trobe University has campuses at the old technical school and at Flora Hill, and there is a regional institute of TAFE. Secondary colleges are at Eaglehawk, White Hills, Kangaroo Flat, Golden Square and Flora Hill, and there are Catholic, Anglican coeducational (Girton) and two other Christian colleges. Between 1966 and 1991 the Bendigo region lost 27% of its manufacturing employment (or 1339 jobs). This was more than offset by Bendigo's growth as a regional service centre: wholesale and retail trade jobs grew by 67% (2286 jobs), finance, property and business by 294% (1556 jobs), public administration by 222% (1118 jobs) and community services by 148% (4118 jobs). Downsizing during the mid-1990s dented these figures, but Bendigo and suburbs' population nevertheless grew by 2500 between 1991 and 1996. Tourism was also a bright spot. Growth in the finance sector was reflected in the formation of the Bendigo Bank (1995), which traces its origins back to several building societies, the earliest being the Bendigo Building Society (1858). It opened numerous branches in north-west Victoria, along with community banks in Melbourne, Victoria, New South Wales and South Australia. Gold dominated Bendigo's image of itself into the mid-twentieth century. Mining dwindled and revived, keeping alive the hope of inexhaustible auriferous riches. The community's first initiative in the direction of tourism came with the realisation that mullock heaps and dust were an eyesore and a health hazard. The Sandhurst Council lined streets with trees, converted the camp reserve to Rosalind Park, laid out a botanic garden at White Hills and created the Lake Weerona reserve (1875). By the 1890s Bendigo called itself Forest City. Throughout these years Bendigo's handsome built heritage accumulated. But still, gold was solid and bankable, and tourism capricious or ephemeral. In the 1970s those roles were reversed. A branch of the National Trust was formed, and pounced on the tram fleet when the rail network was closed. Urban conservation studies followed in 1977 and 1993. In the 2000s Bendigo's art gallery secured a series of travelling exhibitions, so successful that tourists had to book ahead and submit to being herded through the gallery to keep the queues manageable. Bendigo's role as a regional service centre has already been mentioned. It has become a population sponge from its hinterland towns and a destination for some Melburnites who find Melbourne house prices unbearably high. Other Melburnites relocate to places like Castlemaine and Heathcote and commute to Bendigo for work. The present shape of central Bendigo is an irregularly bounded suburb, taking in the commercial centre and inner housing areas that run west to Golden Square, north to Ironbark and Long Gully, east to Back Creek (Kensington) and south to the railway line (Quarry Hill). It also includes Rosalind Park and Lake Weeroona. Within Rosalind Park there are the heritage listed police barracks (1860), Camp Hill primary school (1877) (345 pupils, 2014) and Bendigo high school (1907) (1764 pupils, 2014. Shopping is found along Pall Mall (McIvor Highway) and streets between there and the railway station. In 1995 Bendigo Marketplace was opened, on former railway land west of the station. It has a discount department store, a supermarket and about 100 other outlets. Travellers from the railway station make their way along Mitchell Street to Pall Mall and then along the View Street heritage precinct to the gallery or other attractions. The ecclesiastical precinct is westwards, including the imposing Catholic cathedral. On 7 April 1994 Bendigo city was united with Marong rural city, Eaglehawk borough, Huntly Shire and Strathfieldsaye Shire to form Greater Bendigo city (3020 square kilometres). In 1995 parts of McIvor Shire (Heathcote) and Metcalfe Shire (Redesdale) were added. Bendigo City Council had previously administered 32.5 square kilometres. Greater Bendigo is described in a separate entry.